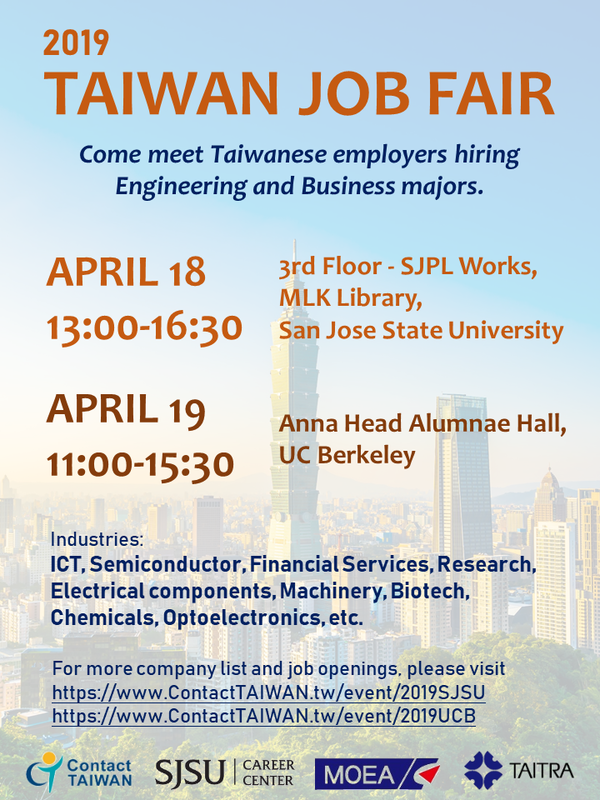 Taiwan Trade Center, San Francisco office cordially invites you to participate in the 2019 Contact TAIWAN Silicon Valley Campus Career Fair. Come speak with representatives from participating companies and interact with other participants. Everyone is welcome to participate in this event. Just bring your resumes! 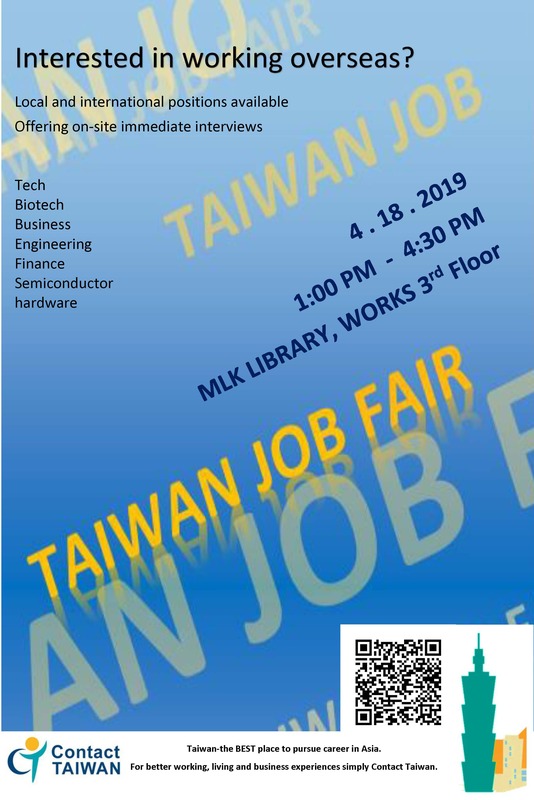 Registration is encouraged for scheduling interviews to meet one on one with company representatives at ContactTaiwan. 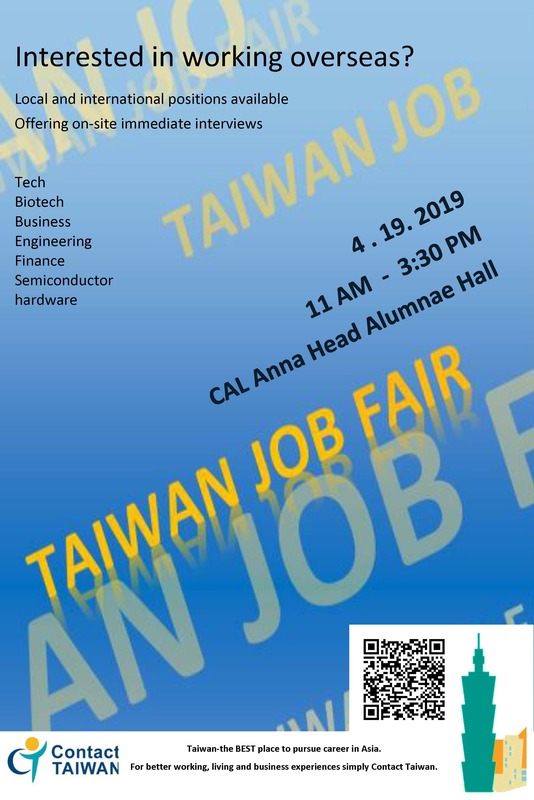 For event details, please visit 2019 Contact TAIWAN Silicon Valley Career Fair. Participating companies from Silicon Valley and Taiwan: Peimei Shinemound Enterprise Inc., E.sun Commercial Bank, ACTi Corporation, Etron Technology Inc., Taishin International Bank, HonHai/Foxconn Technology Group, Micron Technology Inc., Industrial Technology Research Institute (ITRI), Institute for Information Industry(III), Bank of Taiwan, Kenmec Mechanical Engineering Co. Ltd, Asustek Computer Inc., Ginar Technology Co. Ltd, Mediatek Inc., Corning Display Technologies Taiwan Co. Ltd and more! Registration is free! For a quick registration, please RSVP here. We will help you to register for an interview time.